The following Breath Exercise is based on simple Pranayama, an Indian Breathing exercise and meditation. Its a great way to release stress, anxiety or irritability. Find a quiet peaceful place to sit, for five minutes to 10… Its best to sit with a confident , but relaxed square posture. Repeat this for about five to ten minutes. If thoughts intrude, imagine them floating away… and return to being mindful of breathing. As with most breathing exercises, one can modify this, standing or laying down. its a good idea to learn it sitting first. Pranayama, is practice of controlled breath from Indian Yoga. With a commitment to regular practice, Pranayama is a basis of Yoga meditation, that can be used to improver fitness, health and wellness , or self realization and spirituality. The simple and basic version above, can be used as a breathing exercise for stress and anxiety management. I feel sharper and a little more energized afterwards. This breathing exercise can be used along with other physical fitness exercise. where some basic breathing exercises are listed. Sometime, somehow, growing up.. I forgot how to breathe, properly. I don’t know why or how, but Like a lot of people I forgot how to breathe, properly. Most healthy Infants know how to breathe, they breathe using their abdomen, naturally. Later many people, like I did apparently, change to breathing with their chest muscles, unconsciously. Not only is this less efficient, this upper body breathing, is prone to feeling anxious or stressed, frequently. When we are startled or frightened we gasp. This is a sudden inhale of air, using the chest muscles. Some believe this is part of our “Fight or Flight” anxiety nervous system (known as the Sympathetic Nervous System), where quick gulps of air are taken in by the lungs in order to have energy to react to whatever has frightened the organism. It is possible that in are stressful modern world, Some of us slowly forget how to breathe properly and calmly. Learning to breathe properly again. Our bodies use quick inhales (gasp) to prepare for a “fight or flight” in Anxiety. However our bodies relax on the exhales of our breath. Focusing ones breath on long exhales, expelling air out from the diaphragm is more efficient and more calming and natural. Sit on a chair with back straight, Lay down, or find a comfortable place to relax and breathe. Expel your breath completely from your diaphragm. Feel your belly collapse inward. Let yourself inhale. inhaling will happen naturally without effort. Repeat this for a couple minutes, or as long as you like. The goal is to learn to breath properly, unconsciously, from the diaphragm again with long exhales, just as we did when we came into this world. 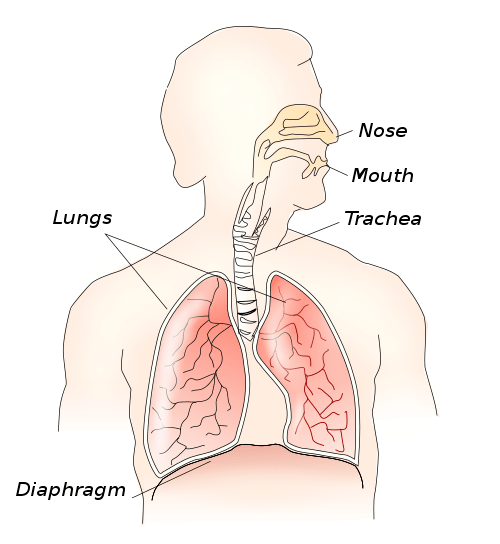 Properly breathing: breathing from below the thoracic diaphragm or “breathing from the belly” is an aid to living more calmly; and less anxious and irritable. Life can be stressful as it is, there is no need to add anxiety with gasping. More breathing exercises listed on the Breathing Tab of this blog. A simple Breathing exercise …. 1. I lay comfortably on my back in bed. I make sure my neck back and hips are ina comfortable posture. 2. I breathe normally and naturally. during this time I simply breathe, make no effort to change my breath. I am simply witnessing my belly and breath, hiccups and changes. ...as if my breath were a wave my consciousness is riding. if I catch my mind wondering on other thoughts , I gently bring it back to breath. 5.. and then my I here my alarm clock blaring and its time to get up for work. This Breathing exercise is a good for insomnia, killing boredom, stress relief, or just relaxing. Sometimes I will have very vivid dreams after doing exercises before going to bed. but this an easy one to do and I feel better afterwards. Its also a helpful aid in learning to relax when naturally breathing and meditating. I’m sure reading this may induce drowsiness as well. 1. start with a good sized inhale. I Don’t worry about how fast I’m Breathing & Counting at first..it ok to start off fast. 4. Exhale “5..4..3..2..1..0” Just as number 2. 5…..4…..3……2…..1……0 slower and slower each exhale. 7. (optional) inhale, then exhale an whisper “I’m Safe” . Exhale and “I’m Safe” replaces the counting. I am not a doctor or health care professional, but I have used breathing exercises for along time. they are a good free and portable stress management plan and tool. Breathing and Counting is the first Breathing exercise I have learned. ( from a Mental Health Nurse). Its best to practice this exercise daily, good for stress management, Mental Wellness Management. and to have it ready when feeling particular distress. Breathing and Counting is a good tool regain control of our breathing and emotions. For me,It has been helpful not the fear momentary Intense emotions of a very distressful episode( panic episode or strong feelings), but to allow them to happen through the body and out of the body , while breathing and counting, and reminding myself afterwards that I am safe. otherwise Breathing and Counting is a good plan health exercise and helpful to calming down clearing the mind. Breathing is the center of our being and wellness… Quietly simply put: If you stop breathing you wont live very long. Breathing is a important part of our metabolizing ,our Nervous system and our bodies “Fight or flight” anxiety response. Thus the process of breathing directly impacts the process of thinking, as well as most other bodily process. remembering not to worry if misses a count. exhale 4-3-2-1-0, Inhale 1-2-3, continue to repeat. after a couple minutes slow down the counting. end whenever one wishes, but give it about 5 minutes. I learned this simple wellness tool in a doctors office Years ago. I was feeling the symptoms of BiPolar Disorder I: in this case anxiousness and the intrusive inability to focus my thinking. I was not able to even speak clearly, that day. A mental Health nurse taught me the simple breathing exercise above . We did it together and I was able to focus my mind for a period of time. I would hug that nurse if I could finder today. She helped me find one of the most important stress management tools that I still use to this day. *Click here for a short list of Breathing exercises I use today. Breathing exercise are not only a helpful form of stress management, They are a free and complete portable tool… one can even do them in a crowded room with no one noticing. In my case today I use Zazen (zen meditation) and Mindful meditation primarily. breathing exercise and meditation are not just for consciousness, they a great help for over all mindful and physical well being.